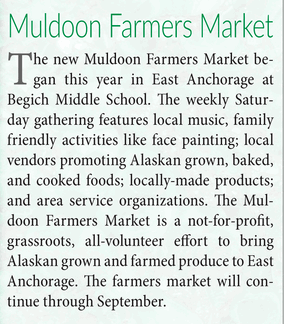 Muldoon Farmers Market Board of Directors and Volunteers will meet at 5:30 p.m. Wednesday, March 13, at the Starbucks in Fred Meyer, 7701 Muldoon Road, to firm up plans for 2019. This all-volunteer market is managed by a handful of your neighbors. We would welcome more volunteers to join in at the happiest market in town.